Dickens's Christmas Books. A Christmas Carol, "Stave Four: The Last of the Spirits." Barnard's sixth illustration (p. 32) shows Scrooge's charlady and laundrywoman joining the undertaker's man to pawn his belongings, in the process revealing how they really felt about him. Barnard's final illustration compared to that by Sol Eytinge, Jr., and the final Abbey plate. 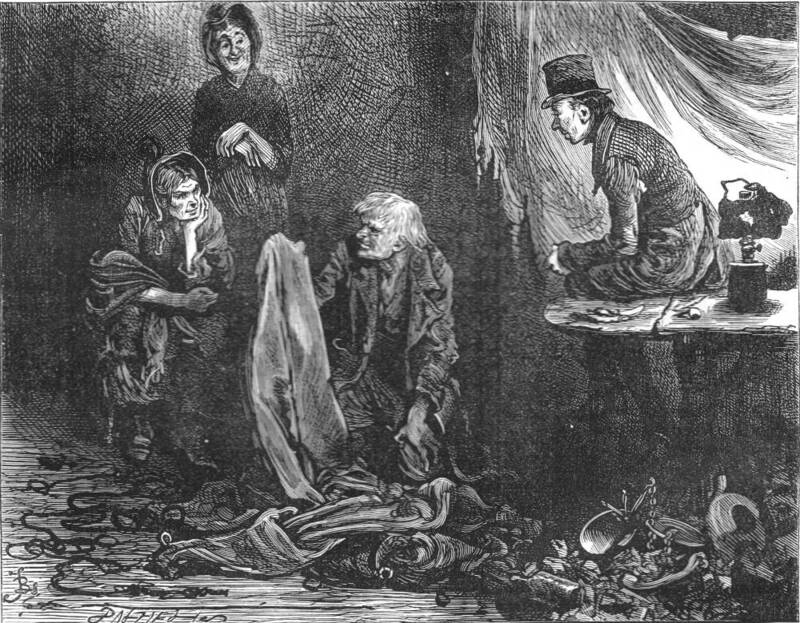 In his original 1843 sequence of eight illustrations, John Leech did not provide a picture of Scrooge's visit to the the rag-and-bone shop to watch the people whom he had known and taken for granted to give him domestic service to dispose of his clothing, personal belongings, and even his sheets. 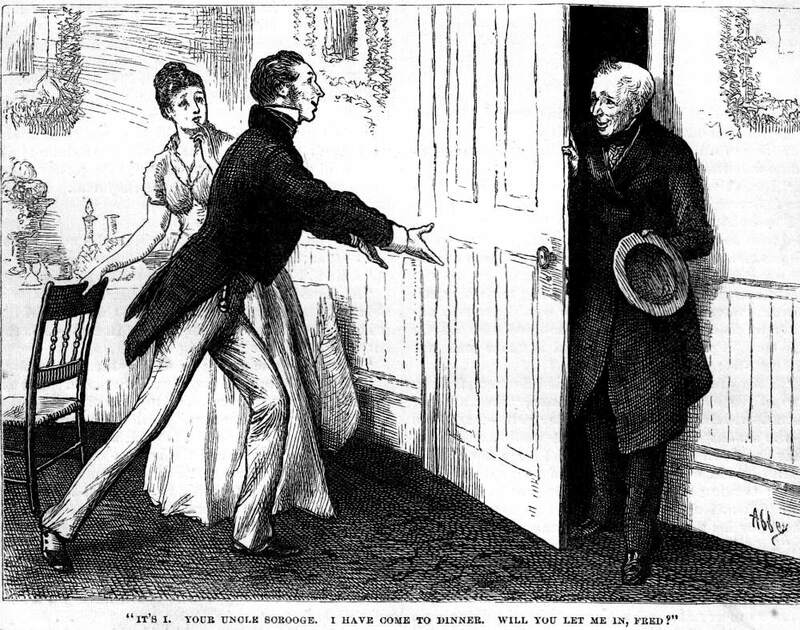 In his sequence of six illustrations for the 1876 Harper and Brothers Household Edition of Christmas Stories, American artist E. A. Abbey eschews the socially provocative aspects of A Christmas Carol as he focuses on the more genial aspects of Scrooge's redemption, concluding with his arrival on nephew Fred's doorstep as he pleads to be admitted to the family he had formerly spurned and to participate in the family holiday has has ridiculed as "humbug." "What odds then. What odds, Mrs. Dilber." said the woman. "Every person has a right to take care of themselves. He always did." "No, indeed," said Mrs. Dilber and the man together. "We should hope not." Technically, the bartering transpires in the context of old Joe's parlour, which is separated from the outer shop by a screen of rags, so that both illustrators have conflated the two rooms, probably to emphasize the carrion nature of the establishment. Neither felt inclined to realise the extreme unpleasantness involved in "masses of corrupted fat, and sepulchres of bones" (29). As for the description of the characters involved, Dickens has given his illustrators little enough to work with, other than Joe's advanced age, pipe, and grey hair. On the other hand, Barnard employs the "frouzy curtaining of miscellaneous tatters" (29) and intense cross-hatching to create a nightmarish atmosphere. 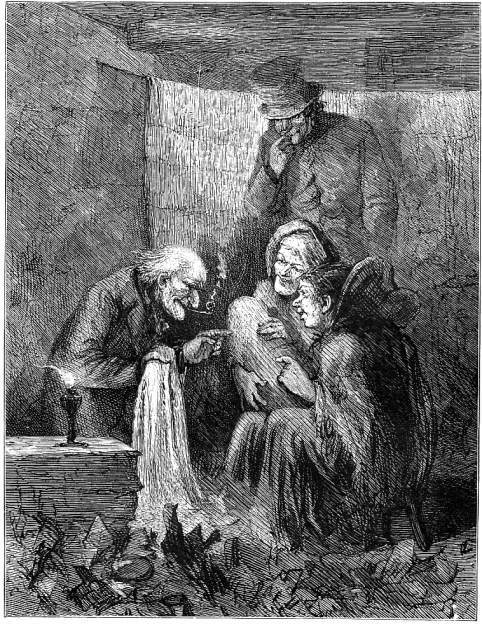 Eytinge uses the faces alone to convey the scene's dominant feeling, which is not the earnest conducting of business we see in Barnard's version but in Eytinge's a joyous glee at finally having bested the miser, as the women and old Joe on bended knee carefully examine the fabric while the undertaker's man looks on from above. The significant difference between the two treatments is Eytinge's caricaturing of old Joe versus Barnard's highly realistic social commentary, reminiscent of his early work for such British periodicals as The Illustrated London News. In the next decade, Barnard collaborated with G. R. Sims on a series entitled How the Poor Live for the Pictorial World (1883). Also relevant to "Old Joe's" are Barnard's large-scale canvasses of social comment upon the urban scene as Saturday Night in the East End (1876), which shares with this small-scale picture a certain infernal or Dantesque quality. However, none of Barnard's participants in the bartering could justly be designated an "obscene demon" (30); they are merely conductors of business and agents of commerce, not so different (but for their less than elegant attire) from the businessmen of the previous scene. Scrooge, a dealer in commodities, has himself in death become a commodity, Barnard implies. The triumph of the scene, a parody of Twelfth Night celebrations and "a mock Adoration on a future Twelfth Night Epiphany" (Patten, 187) is the artist's ability to throw over the frowsy and unpleasant moment of choric commentary a certain vividness that transmutes the unsavoury side of the capitalistic enterprise into the engagingly beautiful as we and Scrooge observe the final destination of Scrooge's belongings, crystallising the dreamer's "vague uncertain horror" (27) at the beginning of Stave Four into a powerfully conceived night scene in what Robert L. Patten appropriately terms "the city's colon" (186). Bentley, Nicholas, Michael Slater and Nina Burgis. The Dickens Index Oxford and New York: Oxford U. P., 1990. Cook, James. Bibliography of the Writings of Dickens. London: Frank Kerslake, 1879. As given in Publishers' Circular The English Catalogue of Books. Dickens, Charles. "A Christmas Carol (1843). Il. John Leech. The Christmas Books. Ed. Michael Slater. Harmondsworth, Middlesex: Penguin, 1978. Vol. 1. Hammerton, J. A. The Dickens Picture-Book. London: Educational Book, 1912. Patten, Robert L. "Dickens Time and Again." Dickens Studies Annual 2 (1972): 163-196.